Although we are both Santa Barbarians, Teddy and I met at a mutual friend's birthday party while both were living in Los Angeles. Teddy worked in entertainment, and I was preparing to go to law school to study entertainment and intellectual property law. With many mutual friends, our own friendship developed over the course of a year. With friendship as our relationship's foundation, Teddy and I began dating just two months before I moved to San Francisco for law school. They say that a couple that makes it through law school together can get through anything together. Well, we did! Six years later, Teddy and I exchanged our vows at the Fess Parker Doubletree Resort in Santa Barbara on September 10, 2016. For our honeymoon, we snuck off to a picturesque honeymoon in Bora Bora. We now live with our wonderful community of family and friends in our hometown of Santa Barbara, and are welcoming a precious baby boy into the world this July 2017. The heartfelt ceremony was conducted by a friend of the couple, under a four post structure, cleanly draped in ivory chiffon fabric. Loose and airy ivy and vines elegantly crawled up the structure and fabric. Bold clusters of white roses, orchids and casa blanca lilies added pops of fresh white throughout. Djamila held a tight and lush bouquet of large white casa blanca lilies, white roses, white gardenia, white delphinium, white orchids and a little touch of green ivy to accent the cascade. The bouquet was bound with double faced, ivory ribbon accented with a rose gold embellishment. The fifteen bridesmaids each had a clutch bouquet of white roses and white hydrangea. The stems of the bouquet accented with coordinating double faced, ivory satin ribbon. Once the bride and groom conducted a heart ceremony and said their I do’s, they walked down the aisle softened with white rose petals scattered along the sides, lightly fading into the center. 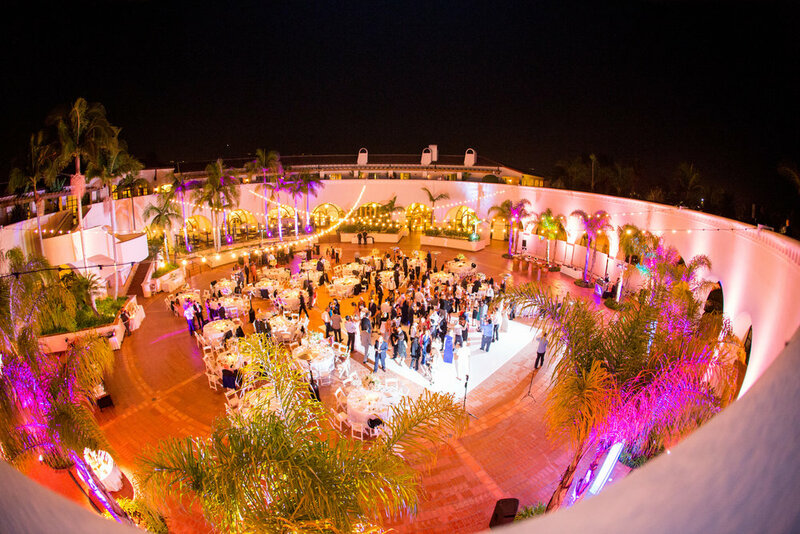 At the 230 person wedding reception, the 32 person wedding party ended their grand entrance onto a white seamless dance floor positioned at the center of the plaza. The white themed decor was visible in the chairs, rental linen and floral. Two centerpiece styles brought height and dimension to the outdoor reception. The first, a tall, fluted clear glass vase filled with clear water and topped with a globe shaped arrangement of white hydrangeas, white lillies, white roses, white snapdragons, white larkspur and white Lisianthus accents. Tall clear glass and tall rose gold votive holders surrounded the centerpieces to provide ambient candlelight. The second style included a low, clear glass bowl filled with clear water and with a full and lush floral arrangement of the themed floral. Tall clear glass and tall rose gold votive holders accented the centerpieces and provided ambient candlelight. Finally, the sweetheart table was placed under the existing ceremony altar, framing the bride and groom for their first meal as husband and wife. After their first dance, the couple cut into three-tiered white fondant wedding cake, and danced the night away with their family and wedding guests, under a starry sky and colorfully lit outdoor plaza.